My Taxi India offers you exclusive packages for outstation travel. These packages are perfect for weekend getaways, trip with friends, excursions, and family leisure trip outside the city limits. Each package is devised keeping in mind precise interests, needs, and budget of our patrons prior to making arrangement for a package. We also arrange for group packages from Agra to places nearby. The cars sent across will accommodate group size to ensure maximum convenience. The exemplary to and fro provision is offered in Agra for multiple destinations from the city of Taj. This is a special package designed to cater to one way drop to traveller’s destinations from Agra. We also offer special Agra city sightseeing tours and any other customized cab rental packages. 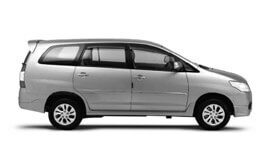 At My Taxi India, we guarantee the unsurpassed car rental services in Agra at highly affordable rates. The weather and climate of Agra is extreme and tropical. Summers are extremely hot and winter remains cold and foggy. Agra city receives heavy rains during the monsoon season, and the weather becomes hot and humid. According to the 2011 India census, Agra has a population of 1,775,134 at present. Tourism contributes to major economy of Agra. The city of Taj also has a considerable industrial base. Agra is home to a good number of apparel and garment manufacturers and exporters. Recently, the city has developed serious market for the automobile industry. The leather industry is one of the leading here. Agra city is one of the top tourist destinations across the country. It is visited by thousands of foreign tourists each year. The historical city in Uttar Pradesh state of India is home to several beautiful monuments including the Taj Mahal and Agra Fort. Other interesting places to visit in Agra include Sikandra, Itmad-ud-Daulah, Fatehpur Sikri, Radha Swami Samadhi, Chini ka Roja, Mariyam’s Tomb, Jama Masjid, Kailash Temple, Mankameshwar temple, Balkeshwar Temple, Prithvinath Temple, Rajeshwar Temple, Guru Ka Tal Gurudwara, Baptist Church, Digambar Jain Mandir, and Catholic Church. A visit to this amazing city will be quite satisfying for you and your entire family.